Your booking system will always have one Purchaser booking form. This form is used universally across the system each time there is a booking of any kind (including purchases such as Physical Items, Vouchers and Memberships). You can have several different Participant booking forms withiny our system, and these can be used by different products as is required. Relating Member forms allow you to gather additional details that relate to a Participant. For example: medical information and Parents. Click " Add Booking Form"
Provide a Name for the Booking Form. If a suggestion is chosen, should it be shown on other forms for the same booking? Provide the "I'm Attending" option for the Purchaser. The Age Restriction part to the Booking Form is ideal for users using the system for After School Clubs and Products which only allow specifc ages. This is done by simply putting in the age you want it to restrict from and too. 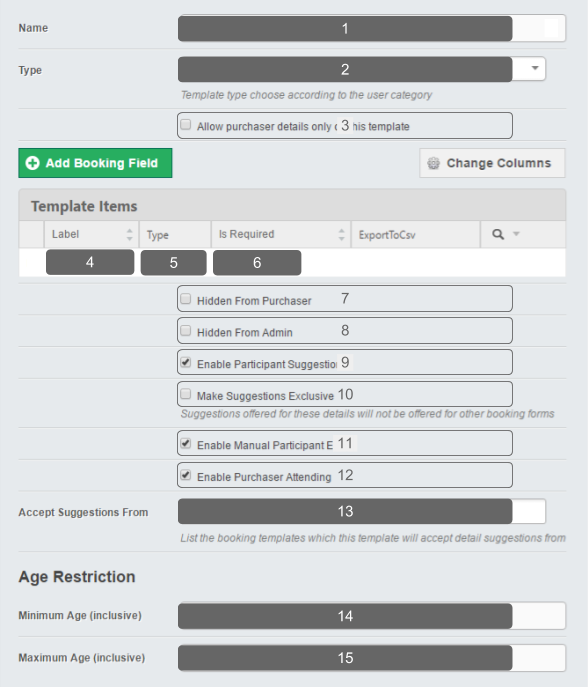 For example this Booking Form could be linked to a Product which only allows 3-5 Year olds. In the fields available you would then want to put 3 in the minimum age and 5 in the maximum age. This will only work if you have a Booking Field of DOB in the template. Once you have created your Booking Form, you can then start to add Fields to the Form. Click " Add Booking Field"
If you are using a Custom Field: see below. Once you are happy with your field, click " Save and close"
Is this field shown on the Billing Page? Is this field shown on the Customer's Profile? Is this field editable by the Purchaser from within the MyAccount? Is this field editable only during Admin Bookings? Note: During Public bookings, the Purchaser will see this field as read-only. Is this field read only? The maximum number of characters that can be entered into this field. If using Options Type is this Option currently being used? For example you could have "Medical Information" as the display name and in the help box you could have a short description saying "Leave blank if you do not have any medical information." During the process of adding a new Booking Field, select the Type "Custom Field (New)"
Provide other settings as required for this field. 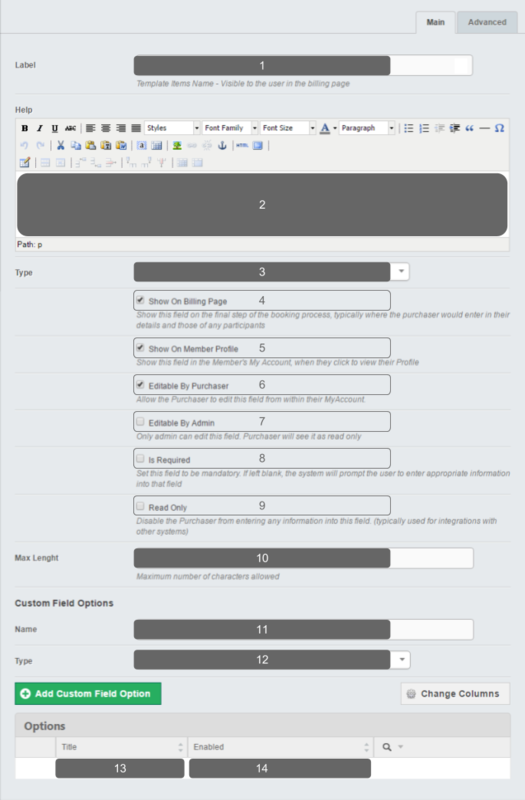 5.1 Text - This field will allow the user to write a short string of letters & numbers. Ideal for codes and names. 5.2 Textarea - This field will allow the user to write a lot more information using a string of letters & numbers. This is ideal for longer answers such as Medical Information. 5.3 Options - This field offers a drop down of options to the customer. Ideal for multiple choice questions. See below to learn how to do this. 5.5 Numeric - This field will allow the user to type in a range of numbers only. This is ideal for phone numbers, codes that only take numbers. If you are using Type: Options, click " Save"
6.1 To add new options, click " Add Custom Field Option"
6.3 Click " Save and close"
6.4 Repeat steps 6.1 onwards as required. Once you are happy with your custom field settings, click " Save and close"